The Acel Group is an electric turn-key supplier with operations in the marine market World Wide. Important activities include electrical total deliveries to the shipyards in connection with ship building, service and remodeling services to ships world wide. 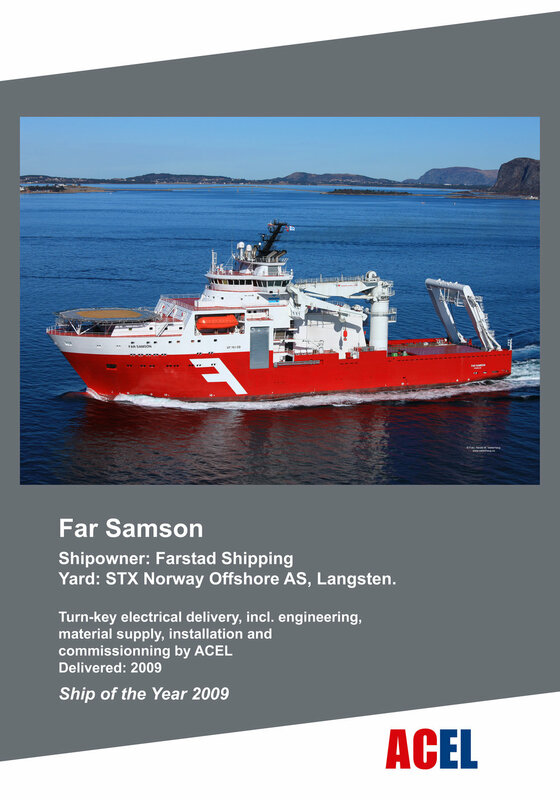 Acel AS has on it’s reference list complete responsibility for the electrification of more than 60 offshore vessels of various types, many of which are among the most advanced vessels of its type ever built in the world. Acel has a vision to be an environmentally focused, cost efficient, reliable and global partner for the Customers in the Marine electrical market with a mission to help the Customers in optimizing their operations and reduce the risks in project execution, by using their thorough knowledge and competence in electric systems. Complete Electrical Engineering Ships, including the important installation related engineering (cable database, job packages, procurement list materials). Courses incl. HUET for preinstallations and Service work on Vessels in operation. Strong reference list – turnkey electrification contracts ferries and OSV’s.